Junk Services does not only assist residential customers. The owner, Rick, has over 12 years of experience in the foreclosure business. This involved performing a complete clean out of an entire property and preparing it for resale on the market. As his business has grown so has his list of pleased commercial customers. 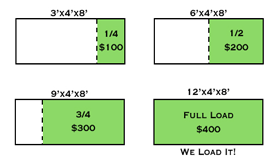 The above image explains our pricing for a full dumpster or less, but at times there are preparations that are required by management and due to this many commercial jobs are bid by the specific job. In the past we have been over 30% lower than national companies on jobs that involved hauling off over 26 cubic yards of junk. Give us a call and we guarantee your business a lower price. We are a family owned business, not a franchise, that is why we can guarantee a lower price than our competition. We work with you, not against you, with our prices. 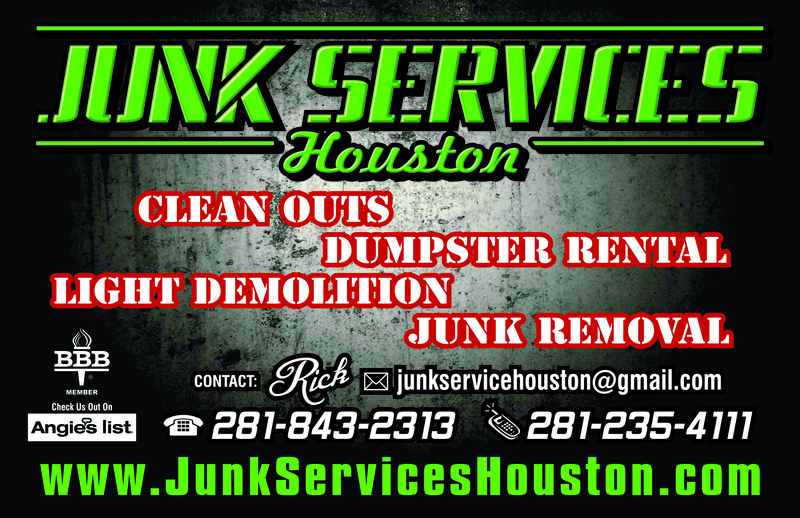 At Junk Services Houston you will always be charged the price that is cheaper for you, our customer. Book online now or call today and receive your free no obligation estimate! We have cleaned and swept 220,000 square feet of warehouse for the business Champion’s Windows. It took five days to load, haul off, and clean the four warehouses. We removed 19 dumpster loads of junk and recycled over 11,000 pounds of materials from this job alone. We appreciate our environment and mean to keep our children’s playgrounds from being built on top of landfills. Junk Services has performed heavy trash day for the town of Thomsons, located southwest of Houston. This involved a curbside pickup of all the materials the town’s residents left out the night before. It took two days for us to haul off 12 dumpster loads full of junk. We also disposed of 10 dumpster loads for a piping company called DMC Carter. This job was a little irregular due to the fact we were given a time limit due to another junk removal company failing to appear at their scheduled time. Junk Services was able to finish the job with a day to spare, the day after the job was called in and bid. As you can see no job is too big, and by no means is a job too small. If you work for a school district, hospital, warehouse, or just about anywhere that is in need of our services, give us a call. We can help. Although be wary of franchises and the higher prices that comes along with those names. Call us, we are a family owned business that focuses on our current customer and not the next job on the books. Let us get your space cleaned up and leave extra money in your business’ account.